From The Art of the Improbable, Trix Kuijper. Inquire. Trix Kuijper returns to the Studio Gallery with a new collection. A delightful concoction of fantastical creations, featuring horned beings, giant eggs and, of course, her signature “mummies”. Warning: These works were created in a facility entirely free of nuts, but occasionally subject to a little craziness. Receptions are free and open to the public. Work from Art & Soul at Studio Gallery. Proceeds from art sales during our March exhibition, Art & Soul, will go directly to Studio Gallery, and support our mission of fostering a public appreciation for the world of the arts. The arts are at the heart of our community. Art is the basis of the graceful architecture we walk past each day, the music we dance to, and the paintings, photographs, and visualizations we’re drawn to. Art is at the core of who we are as people. Now, we’re making it easier than ever to support the arts - and specifically, our nonprofit organization, Studio Gallery, one of the longest-running artist cooperatives in the D.C. area. Featuring exclusively donated artwork, this group show will exhibit a large range of styles and mediums, from an original photogravure by Edward Curtis, to stormy seas captured on canvas, to sculpted, human torsos the size of your forearm. If you’ve been waiting to acquire an original work of art, there has never been a better time. When you support us, you help keep us here - at the community’s heart and soul. From Green Gestures, Jean Jinho Kim. Inquire. By starting with inorganic, man-made materials, I can imagine their potential to be reshaped and repurposed into dynamic forms. I choose auto parts, LED lights and other common objects to express my experiences and perspective in a way that can be inclusive and can engage the viewer in a meaningful dialogue. I intentionally use a wide range of materials to bring unexpected pieces together and to give materials new purposes. I aim to shatter the preconceived notions of the potential of each object as work. By using components that range from expensive gold paint to discarded used auto parts, I work to extend the meaning of art and diminish predictable boundaries. There is no hierarchy. I use a combination of various objects that are familiar within a given space to create new arrangements transformed from static to transitional. Using identifiable objects creates a constant interaction between the separate pieces of the work and the final work itself. Not only are the physical elements of each piece important, but also the space they encompass is intentional. Each time I create a work, I keep the physical space in mind. My work includes the environments in which they are installed. My art, the walls, the floor, the viewers and light each create another dimension; each aspect is a participant in the final product. (Left) Glance, Nicole Ida Fossi. Oil on cardboard. (Right) Ceramic Vase, J.S. Herbert. Inquire. The Left Bank of New York, Pam Frederick. Acrylic on paper. 22" x 30". Inquire. Hot & Cool. Two words that are often used together to describe jazz. Hot can be cool, and cool can be hot, and each can be both. My love of jazz is what informs my art. It is my attempt to fuse rhythm, color, movement and improvisation into the pieces you see here today. Recline, Alison Rash. 36" x 48". Acrylic and graphite on Canvas. $5,500. Inquire. Image courtesy of Adah Rose Gallery. Studio Gallery is excited to announce a collaboration the Adah Rose Gallery: Carte Blanche: Adah Rose Comes Home to Studio Gallery. This invitational exhibition will feature works by a variety of artists working in a range of mediums. I began my career in the art world at a wonderful Gallery in Dupont Circle named Studio Gallery. I was the Director there for several years and was embraced by an amazing community of artists. I continued to curate shows there over the years. Studio Gallery gave me the opportunity and confidence to open my own small Gallery in Kensington, Maryland. It is hard to believe but I have had the Adah Rose Gallery for 7 years! I am excited to guest curate the January show. Studio Gallery is a space I know and love so well and a place I have celebrated many wonderful times in. I will be showing a number of Adah Rose Gallery artists and a few guest artists as well. I love the expanse of the upstairs space and the intimacy of the downstairs. I can envision so many of the exhibitions that have passed through the gallery and the Openings, musical soirees, author talks, poetry readings and dance performances we had there. My years at Studio Gallery were greatly enhanced by so many wonderful interns and our lively talks and afternoons together. Thank you for welcoming me back. The space is beautiful and the community even more so. I hope everyone enjoys the show! 29th and N (South), Gordon Binder. 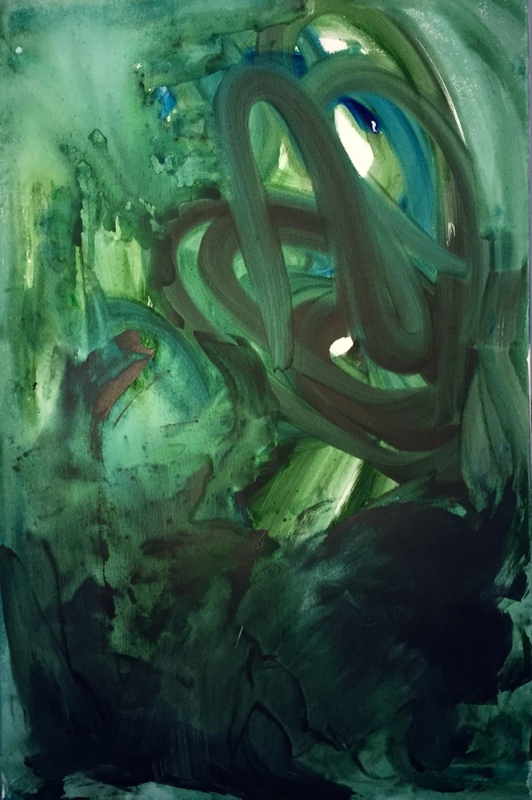 Oil on paper, 19” x 11-1/2”. Inquire. Towers and spires and domes, oh my! I’ve long been fascinated by the shapes and forms you see in the skylines of major cities -- the towers, spires, domes, bridges, and more against the sky, against the weather -- viewed from streets, from roof tops, out of windows in between. And by the bustle of city streets and alleyways, the people, the traffic, plazas, landscaping, signage, reflections in the windows, on and on. My sketchbook is ever at the ready, one or another drawing the inspiration for a painting. Some of my paintings are based on actual places, others are imaginary or abstracted from what I see around me in what I call an expressionist style, somewhere on the spectrum between realism and abstraction. I align with the painters of “modern life,” observing and recording through my art some part of the visual experiences of city living. Can’t make it to the show? View the works on display with our digital exhibition catalogue. Tracks, Gary Anthes. Archival print, 2018. Edition of 6. Inquire. Valentine, TX (cemetery), Kim Llerena. C-print with photo-etched zinc plaque. 27” x 27”. Edition 1 of 5. Inquire. One Family, charcoal & collage on paper mounted on canvas, 52"x40". Inquire. In her new exhibition, “One Family,” Deborah Addison Coburn steps away from abstraction to present a collection of portraits, drawn from treasured family photographs, in celebration of America’s diverse immigrant heritage. As a daughter, even a great-great granddaughter, of people who came to the United States by choice, she was moved to respond to the antipathy being expressed lately toward immigrants. Members of her own family and others like them died because they could not find refuge when conditions in their countries became lethal. The families featured in these pages are, admittedly, not drawn from a broad cross-section of Americans; they are from Coburn’s circle of family, friends and online acquaintances, in hopes of conveying the richness and diversity that immigrants contribute to this country; diversity which should be celebrated, not feared. Can’t make it to the show in person? View our digital exhibition catalogue of One Family. Blanket Patch 3, Harriet Lesser. Canvas, oil paint, polyester resin, 18” x 20”, Completed in 2016. Something in the undulating stripes and somewhat rough outlined characteristics of a camel hair blanket have been a an influence since Harriet Lesser bargained for it as a Peace Corps volunteer in Nigeria. Lesser has returned to these works, adding here and there as it seemed needed. Bringing out contrast, subduing color or adjusting elements worked over time. The stripes themselves have carried political implications as well as landscape and figurative manifestations. The weight of the fabric is a surprising balance to the flexing but sculptural lines of the charcoal. For Lesser, it is reminiscent of more ancient statuary but frozen in a moment. The blanket both covers and reveals. Can’t make it to the show in person? View our digital exhibition catalogue of CoverUp. 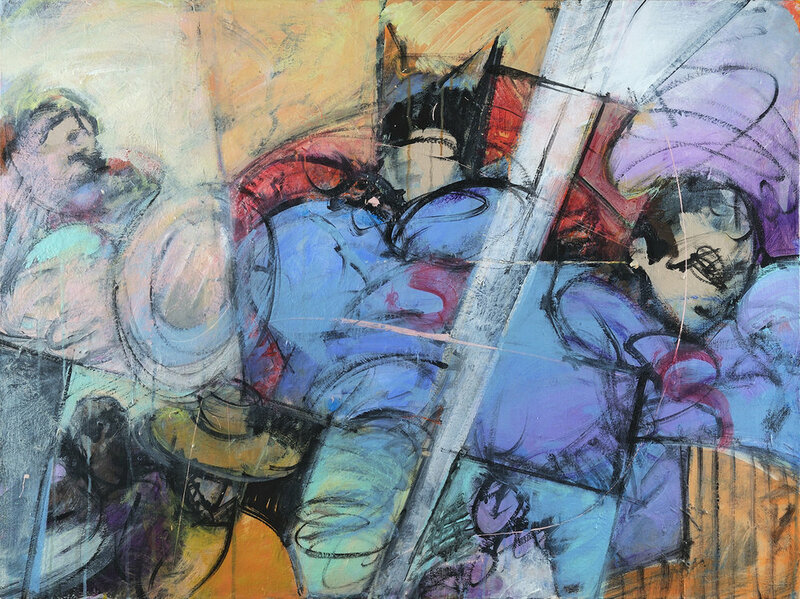 Barbara Williams presents a series of large works that reflect her experienced abstract style. (Left) Temporality, Nicole Ida Fossi. Oil, acrylic, and colored pencil on paper, 18” x 24", 2018. (Right) Galaxy 1, Suzanne Goldberg. Oil on Canvas, 24” x 24”. From the Galaxy series. 2018. Nicole Ida Fossi presents Soft Focus, a collection of recent oil portraits on paper searching for elusive tenderness, a softness revealed both through inspiration and implementation. Says Fossi, “A direct gaze couched behind a defensive posture or a ephemeral calm look amidst distraction; the collection centers on these individual moments of fierce vulnerability, united in revealing yearning isolation and subtle bravery. To capture such moments, I lay down lines and light layers of pigment in a method of studied incompleteness. As a result, the portraits balance interior and exterior, paint and paper, and foreground and background in an effort to invert expectations of what is shown and what is concealed. I am interested, especially, in subverting traditional depictions of masculinity and femininity by focusing boldly on soft sensuality and close, almost raw intimacy. Moments of exposed surface allow entrance into the portraits, signifying the emotional openness and vulnerability that drew me to the subjects in the first place.” Suzanne Goldberg presents The Galaxy Series, works on canvas stimulated by images of our spectacular galaxies which inspire wonder. Transitions 1, Oil on Canvas. 30" x 40". (Left) Nest, by Chris Corson. 16" x 13" x 17". Figure: pit-fired ceramic. Inserts: ceramic, glaze, image transfers. 2018. (Right) 7777777 #228, by Yuno D. Baswir. 36" x 36", Acrylic on canvas. 2018. Corson sculpts the human body to explore the human condition. He creates his figures as vessels for inner emotional life, revealing it in every contour and gesture. The works in this show have been pit-fired, adding rich color, sheen and visual depth to the emotional content of his forms. Yuno Baswir's new paintings are the result of his continued exploration and effort to use the act of painting as a way to remember and to praise The Creator. There are two main forms in his latest paintings, namely round shape or circular form, and a straight vertical line. These two forms have specific meanings for him. He takes inspiration from rituals in Islam and verses from the Qur’an, the holy book of Islam. (Left) 7/17/18; 5:56 pm, Elizabeth Curren. 2018, Watercolor and pencil on Arches paper; 9" x 12". (Right) Awakening, Suzanne Yurdin. Mixed media on canvas, 40" x 30". Elizabeth Curren presents Weather, a series of works on paper taken from sketches dashed off as storms approached and from photos snapped just before taking shelter indoors. This year’s thunderstorm season has yielded very active cloud formations: turbulent thunderheads, red sunrises, magenta sunsets and eerie night skies. The intensity of heat, humidity, and wind have had a dramatic impact on Rhode Island’s weather these past weeks. Climate change isn’t coming: it is already here. Gary Anthes, Photograph, 18" x 24" (Unframed), 2017. In the 18th century through the beginning of the 20th, the value of an artwork was largely defined by its aesthetic appeal. But in the modern and contemporary era, artists, critics, and historians often hold the message of a work in higher regard, judging it as equally or more important. Indeed, today the meaning of a work of art is a key element in determining its value, which is why artist statements and other written guidance are provided at most contemporary exhibitions. However, the meaning of art works now draws so much focus that some believe we’ve forgotten the pure visual agency and aesthetic impact that once reigned supreme. Some would even say that the meaning and messages ascribed to a work of art can stand in the way of its pure appreciation by the viewer. In No Context, Studio Gallery’s Summer All Members Exhibition, interpretation is left entirely to the viewer, unencumbered by titles, artists statements, and the like. We invite viewers to return to a simpler world, one in which the art does not need to justify itself and the visual experience is king. My recent work focuses mostly on forests and trees. Regardless of where I am, my eye goes to the beauty of forests, and the negative space between trees, leaves, branches and individual trees. Through drawings and painting I simplify and abstract trees and forests from different areas of the world. In Italy I saw an olive tree thought to be nearly 2000 years old. In South Africa I saw one tree enveloped by another species with the result that they created a new and beautiful symbiotic form. I have also drawings of the human form as a reminder of the effect and responsibility we have to our environment. It is my pleasure to collaborate this show with The Amazon Conservation Association. Their mission is to protect the world’s most diverse landscapes, to train the next generation of Amazonian conservationists, and partner with communities to support communities that sustain biodiversity. They work to protect the rainforest. The warm embrace of sadness. Acrylic on canvas. 40" x 30". 2016. While my abstract work is always energy in movement, there is a more fluid sense of space, a certain permeability that develops over time. Less of a “male” affirmation maybe, more of a realization that the limits of the form are porous, subject to many influences. And a desire to give a painting the freedom to continue its development beyond the studio, in the eyes of those who come in relation to it. Featuring work by Jordan Hamlett Sanders, Jordan Wine, Darius Frank, Megan Maher, Emily Hoxworth, Sarah Jane Jamison, Asha Elana Casey, and Seth Remsnyder. Curated by Nicole Ida Fossi. Jo Levine’s show was inspired by a quote from the late pianist Glenn Gould: “The purpose of art is . . . the gradual, lifelong construction of a state of wonder and serenity.” In keeping with that purpose, her photographs transform details from the natural and man-made worlds into images with a quiet mystery designed to transport the viewer to a serene and wondrous state. Kraus continues her exploration of Clouds explored from many different locations around the world. She enjoys the interplay of outlined shapes mixed with handmade paper collage. The work includes paintings, reduction lino prints, monoprints, and photographs some cut and collaged. 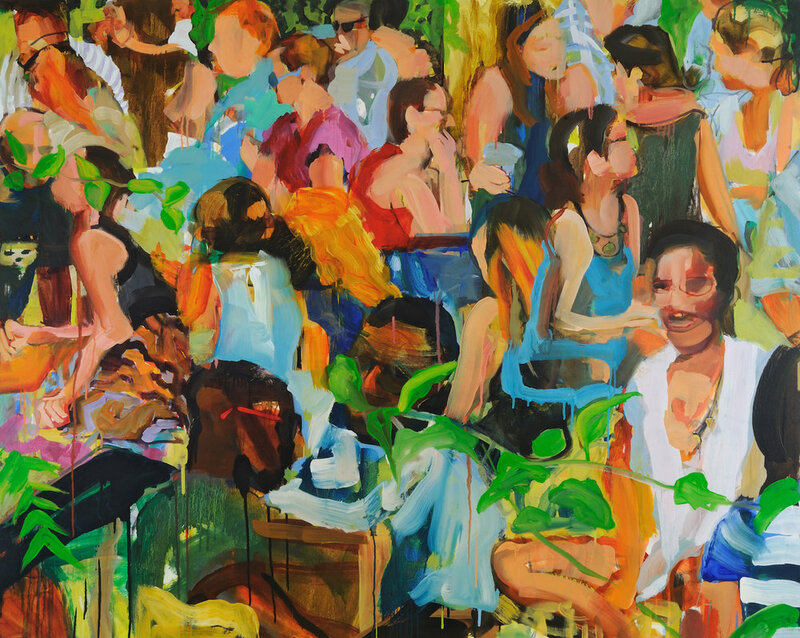 Kauffman revisits "Relaxed States", a series of paintings of Washingtonians listening to jazz on Friday nights in the National Sculpture Garden. 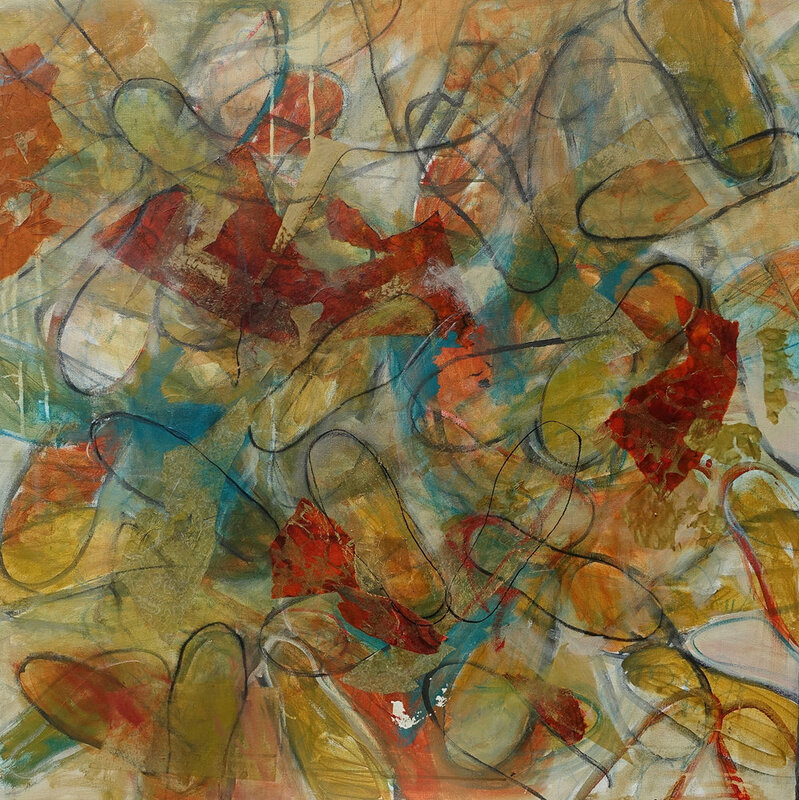 The work celebrates pleasure through the sensuality of paint and interplay of colors. Almost human scale figures painted in saturated, flowing color on large format canvas entice the viewer to engage in their own narrative. This work originated in a found object: a ledger of observations of the 1874 Transit of Venus, a phenomenon occurring every 243 years when the planet Venus moves across the face of the sun, twice. This object opened up a number of avenues of exploration, celestial and astrological, scientific and mythological. This series of mixed media works on paper is the result. This series is in progress and will take at least another year or two to complete, but the earliest pieces will be exhibited here. Yuno's new paintings are the result of his continued exploration and effort to use the act of painting as a way to praise the Creator. 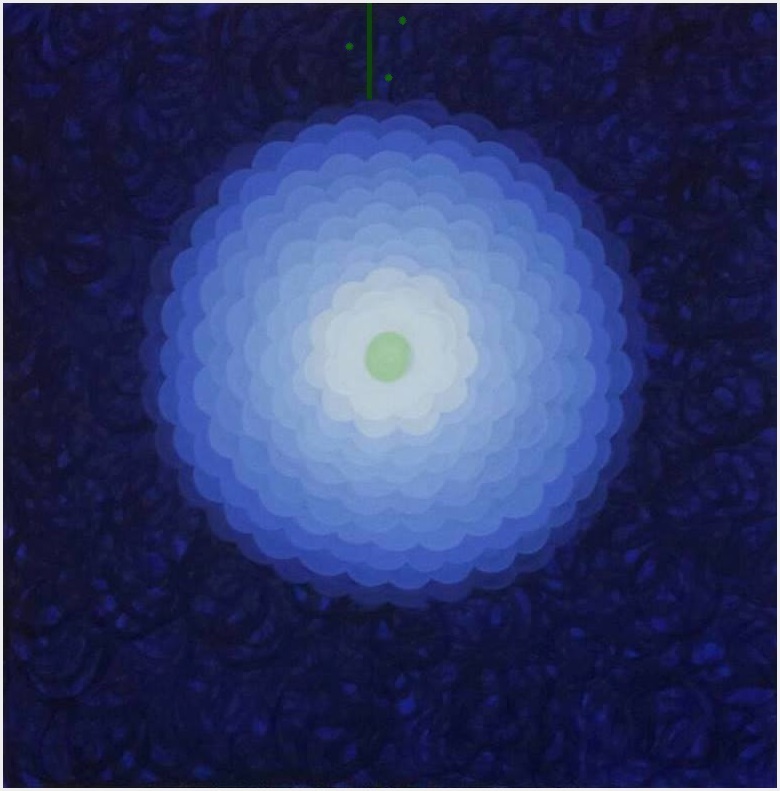 There are two main forms in his latest paintings, namely round shape or circular form, and a straight vertical line. These two forms have specific meanings for him. He takes inspiration from rituals in Islam and verses from the Quran, the holy book of Islam. Age is at the heart and soul of the lifetimes of each of us. The images in A.G.E. focus with joy and humor on the cycle of life and the rewards time brings. TEC is an interrogative dialog between painting and photography, in which two artists working within the technical boundaries of their respective media produce similar (and different) responses to the natural world. Pam Frederick. How Green Were My Vases. Mixed media with collage on paper. 24" x 18"
Creating this current body of work is where I get to let loose. When I paint these vessels and shapes I feel like a sculptor hand-building a pot or using a potter’s wheel. But instead of clay, I use paint, mixed media and collage to create a 3-D effect on paper. I try to establish a satisfying balance of shapes and textures that draw the eye through and around the objects as if it is a still-life. These mixed media sculptures use plaster, papier mache, clay, acrylics and found objects. Each figure is unique, yet clearly part of the same family. Each has her story to tell - see them and imagine your own version. The light of the sun prompted the work for this exhibit. In Skopelos, Greece, the night winds from Africa created cloud swirls and rough seas; in the morning, the sun’s light was refracted through ice crystals and fog, and then danced on the eddies and currents, strengthened by the moon high tide. In Glendo, Wyoming, we saw the solar eclipse, a unique event that was greater than the sum of its parts: the vanishing sun, the dark moon, the four minutes of night time at totality, the stunning corona, and the perfect joy at witnessing this rare occurrence. Using watercolors, drawings, sintra and screen prints, I have tried to recreate the sense of wonderment engendered by observing and researching these phenomena. My intention in producing this series was to examine my own place in this society, distilling the images down to three core elements - subject, environment, and viewpoint. Aware of the image’s enormous power to represent or frame a historical/social memory, and to define a person, place, or time, I wanted to document my own displacement by allowing the viewer to complete the sentence I initiated in my photography. Like myself, each object, although real, dislocates the environment with a sense of “no belonging”. Tomatoes 1. Acrylic on canvas. 46" x 46"
Lois Kampinsky's exhibition features the sites of Spain experienced during her year there. Bold colors and sharp line define the lively atmosphere in Barcelona and around Catalonia, from food, to architecture, to people. By starting with inorganic, man-made materials, I can imagine their potential to be reshaped and repurposed into dynamic forms. I use a combination of various objects that are common and familiar within a given space to create new arrangements transformed from static to transitional. Using identifiable objects creates a constant interaction between the separate pieces of the work and the final work itself. Helicon: river, mountain and home to the Muses. Seamus Heaney’s poem inspired this series of abstract paintings made of poured, gestural layers of color and transparent washes on canvas. 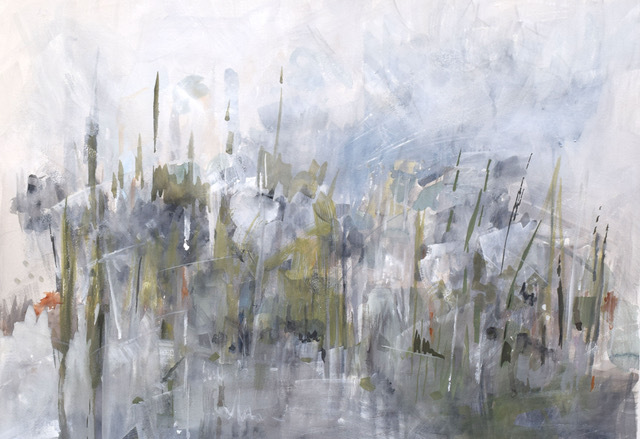 In their first exhibit as new members of Studio Gallery, both Jennifer Duncan and Joy Every have selected work that features investigations into the way the artists see and absorb nature, whether as small as a plant, a bit of design in ice or as large as a sea or mountain scape. Their interpretations of these landscapes through use of color, size distortion, composition and exploration of materials showcases their unique visions of the nature at hand. In her current mixed-media work, Joy starts each piece with a photographic snapshot, allowing her to play with the concepts of time and memory until the resulting mixed media imagery emerges as an idealized or metaphorical version of the landscape and its elements. 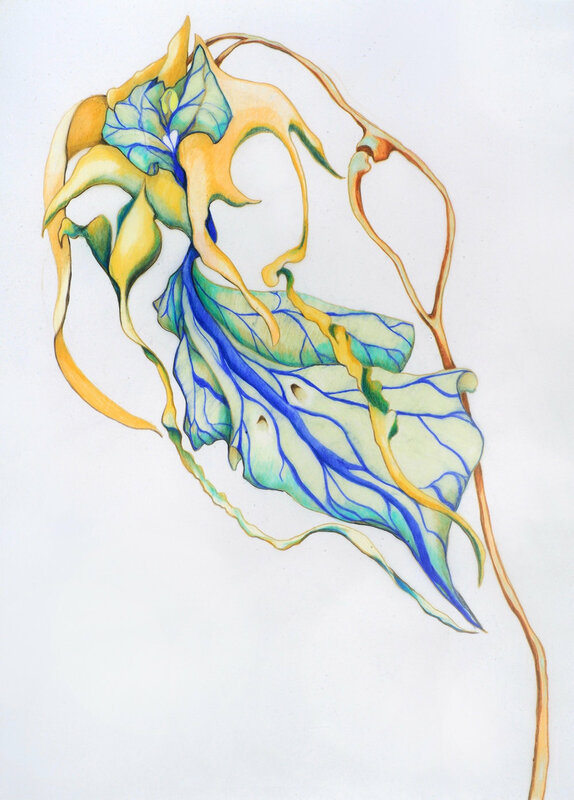 Jennifer uses a variety of water-media in an intuitive process to create color drenched explorations of the landscape and local flora and fauna. The resulting piece reflects both the forms of the natural world and the emotion elicited by her existence within it. The internationally renowned artist, the late William Christenberry, is best known for his evocative photographs of his original home, Hale County, Alabama. Adding to the wide esteem are his many collages, assemblages, paintings, drawings and sculptures, reflecting his unique viewpoints on the American South. Another of Christenberry’s many significant achievements is his role as teacher and mentor for hundreds of students at the Corcoran College of Art and Design in Washington, D.C. From 1968 until his retirement 40 years later, he was an exemplary guiding force for aspiring artists. Those who studied with him owe a major debt for his challenging and inspiring instruction. Studio Gallery, a long-standing collective of local artists, is home to a uniquely high concentration of artists who were influenced by Christenberry's teachings. Twelve of thirty-eight members in this cooperative gallery studied with him. To celebrate the Christenberry effect, Studio Gallery is presenting an exhibition highlighting his continuing influence. By showing artworks that closely reflect his mentoring, the participating members aim to demonstrate his positive impact on them, both personally and artistically. With this exhibit, Studio Gallery highlights a major facet of William Christenberry's long list of achievements while honoring his legacy. Hats Off | Taking Art Outside the Gallery focuses on a collector’s passion for local artists and their creative process. Inspired by this process and a desire to both support the arts and expand art beyond traditional fine art perceptions, this collection merges fine art with an unexpected everyday object, a hat. It began 15 years ago, when Steven Krensky challenged dozens of artists by commissioning them to transform a hat into a wearable work of art, resulting in a new way to look at art, outside of the gallery into daily life. Steven Krensky has accumulated over 50 hats, with room for more. His ongoing collection of hats is a reflection of his lifelong dedication to supporting the arts. This exhibition is a glimpse into an unconventional collection of wearable art that reaches beyond gallery walls and into a hat box, as well as individual works from the artists Krensky has championed. Studio Gallery presents Common Ground, an exhibition of works by over twenty artists, focusing on areas of connection and unity in a polarized time. This collection reflects a variety of mediums and styles, and reflects the importance of diversity in all things. A belief that what unites us is stronger than what divides us is especially critical in a cooperative gallery, and we celebrate this ideal. We find common ground through artistic expression and our desire to both treasure and improve our local, national, and global communities. Common Ground means community, not uniformity, and Studio Gallery is proud to present a group of diverse work that speaks to our commonality. The favorite discoveries of my childhood---coyote bones, skulls, cattails, and a corner of shiny fabric---are the catalysts for the storytelling imagination of my youth. In American Bling, I pair natural objects with gold lamé fabric to connect our own prairies and woodlands to those earlier landscapes of indigenous America and Americans. What is the relationship between our ‘natural’ or ‘native’ wilderness and the shiny fabric of the casinos, reminiscent of the long-ago allure of the Gold Rush? Above all, I put my trust in the physical materials. I surrender to the provocations of working with the fragility of bones, thread, and the unwieldy strength of zippers---and wresting meaning from the mix. Figures relax into abstractions, while vivid colors drip and pool around sewing-work. For me, truth is revealed in the clash of contradictory materials, which opens up an arena of local magic, a peculiar kind of American Bling. Photography is traditionally considered an accurate and true representation of reality. Even in the age of digital manipulation and Photoshop, the vast majority of viewers interpret a photographic image as a reliable index of what appeared before the camera at the moment the picture was captured. Is this so? Isn’t a photograph, even the most documentary, an abstraction of the world as it truly is? For the past several decades, conceptual photographers have explored the border between abstraction and representation in a variety of ways. This Studio Gallery show, curated by Leena Jayaswal of American University, illustrates how a number of the area’s most creative photographers are grappling with this always timely problem. Variations on the Zen circle. Watercolors and monotypes on prepared paper. Imaginary maps of imagined places. And stories that will take you from here to the Triassic. Artist Langley Spurlock creates a parallel universe of maps to accompany the image-filled pages of John Martin Tarrat’s book, UNMAPPED CARTOGRAPHY: Postcards from the Past and Other Foreign Countries. What started out as a desire to capture the historic moments following this year's presidential inauguration, Lisa Allen's show documents the resistance that has swept across Washington D.C. during President Trump's first six months. Shown through photographs and screen prints of the inauguration weekend and protests during the months following, we see the various forms of dissent in the nation’s capital and a first hand look at democracy in action. In this body of work, I first experimented by appropriating works by Jackson Pollock, Jean Dubuffet and Langley Spurlock (with his permission) and used them to create textures in my rocks and mountains. Then, I decided to make my own version of Jackson Pollock and incorporated it into my work. These new images seem to have an interesting effect. Looking closely at familiar surroundings and altering the objects with unexpected color, depth of field, and mixed media changes focus and observation. For me it allows new choices for points of view. 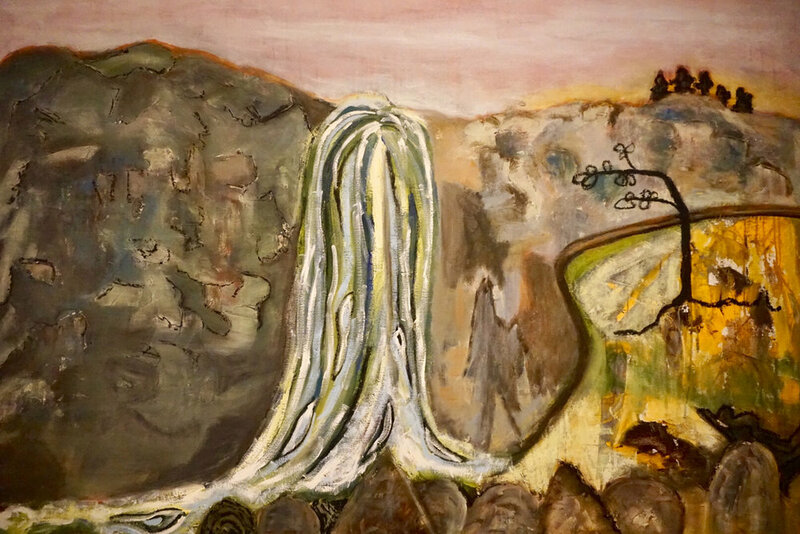 Cascades I of Diptych, Acrylic, 48"x72"
The paintings in the Garden Gallery by Eleanor Kotlarik Wang have water as a source for creative investigation. Rituals make up the human experience; there are infinite variations and kinds. A ritual can be religious or personal, jocular or sacred, light-hearted or solemn. They can be personal, followed by family and friends, or recognized and practiced on a global scale. They can be practiced daily, once a year, or only around a specific person. 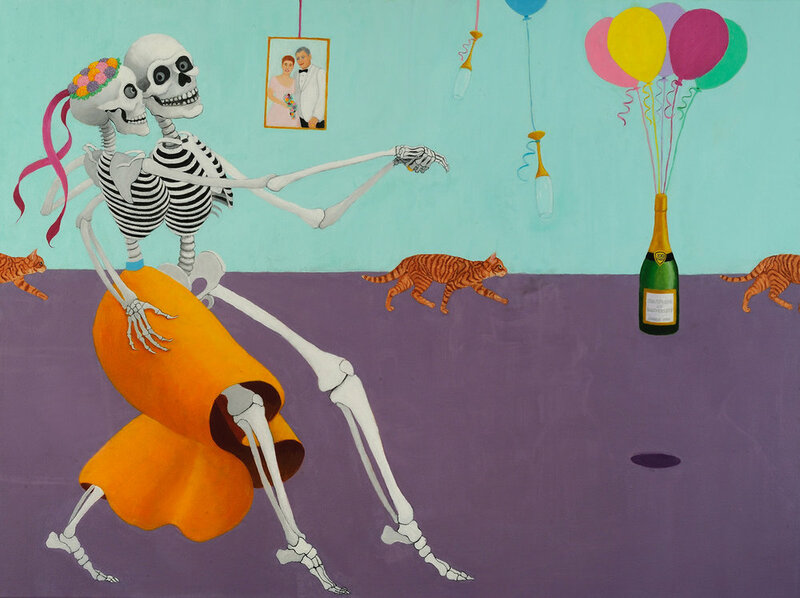 In this newest all member's exhibition, Studio Gallery artists explore the rituals that speak to them. 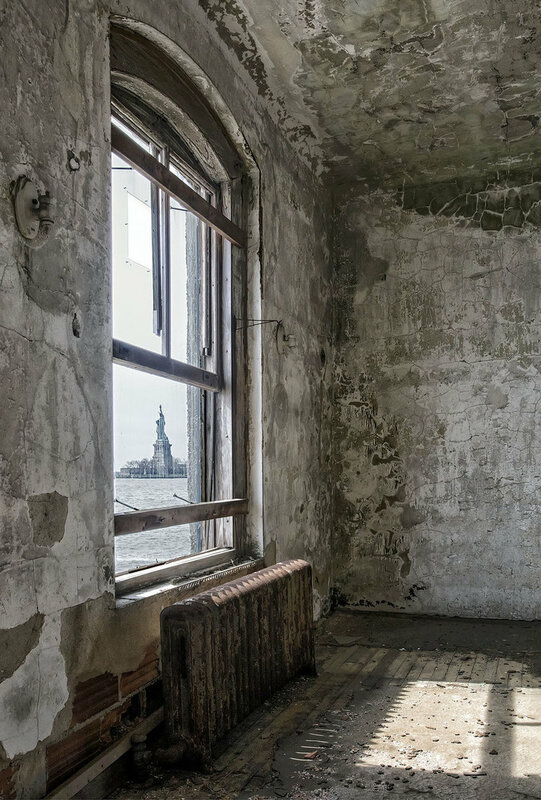 The Ellis Island Immigrant Hospital and the Ansonia Copper & Brass factory shaped the lives of countless Americans over many decades. Now the hospital and the factory are silent, abandoned, revealing themselves by the pale light that streams through broken windows and missing doors. Thierry continues on a path that he opened in his last show at Studio Gallery, letting figurative elements enter his abstract work. In some paintings he is going all the way to an almost “realistic” representation. After more than a decade of pure abstraction, he experiences this new phase with curiosity. “This is new for me, a little like standing between two worlds, says Thierry, the inner and the outer, the visible and the invisible – our human condition. It is an intriguing and wonderful opportunity to explore other facets of the language of painting”. Inspired by a landscape photograph and the rhythms of nature I have used collage and oil paint to develop abstract themes of color and movement. These works show some of the states of our union at this moment in time. Observing where we are now can be important to shaping where we will be in the future. Kauffman explores the common ground where abstraction and figuration coincide in paintings of civil resistance. The work celebrates the physical and mental strength that empowers people to make their voices heard. Using figure and place as a starting point, Kauffman captures moments in snapshots and digitally manipulates the composition and intensity of color. The dense saturated images become the source for the paintings. Each of the pieces in this collection seems to have a back story - but every viewer comes up with a different one. Some of these three dimensional figures are a little bizarre, some are a bit spooky, but mostly they are pure fun. See them and make up your own story. Artist Andrea Rowe Kraus has traveled from the dramatic landscapes of Africa to the lush forests of Burma collecting clouds. In this new multimedia series of monotypes, photographs, collages, and paintings, she explores the illusions hidden in plain sight above us, captured in the clouds. The work in my current exhibition pays homage to Biomorphic Abstraction. The layered, free-form and jazz-inspired biomorphic shapes are the subject of these still-life compositions. This series is based on the rounded abstract shapes found in nature. These shapes are colorful, lush, and sumptuous. The forms are abstracted, yet they are strangely familiar to the viewer. 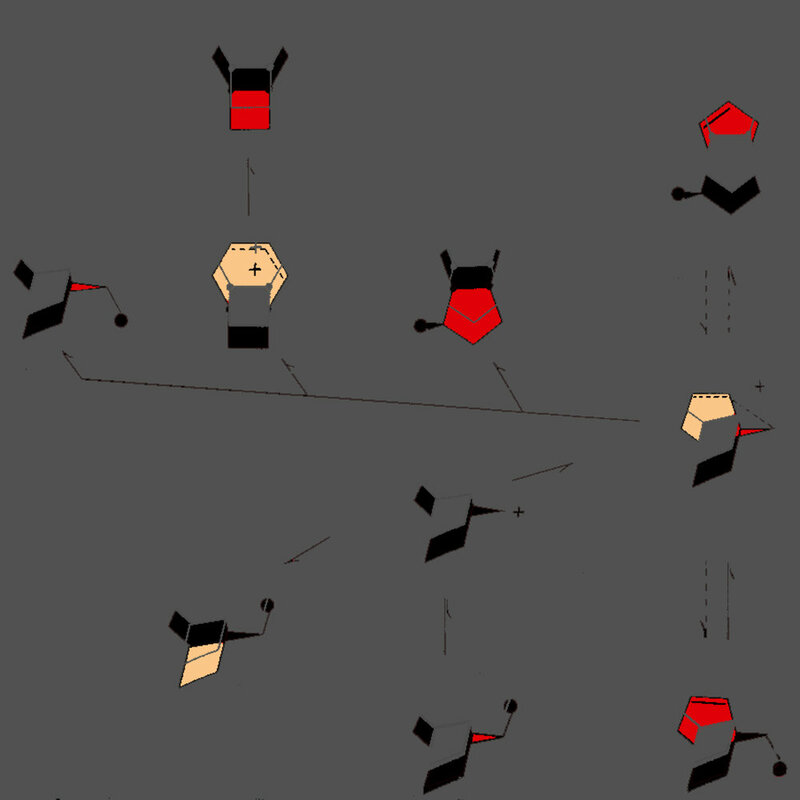 Viewers can recognize them and connect with them on a primal level, though they may not have seen these shapes before. The striking biomorphic art of Constantin Brancusi, Jean Arp and Barbara Hepworth continue to be an inspiration for me. Magic, acrylic, 20" x 16"
the state or fact of being diverse; difference; unlikeness: diversity of opinion. Companions. Oil on canvas. 15"X20"
My concern with form, color and structure inform my work. I use a variety of media to experiment and expand what I do. What I see, What I hear, What I remember. Feeds my imagination, And fuels my work. Sails. Mixed media on paper. 15"x 19"
Continuing my exploration of the art and architecture of distant places, these new abstract works are inspired by a trip down under to Australia and New Zealand. brainstorm examines the delicate nature of the brain. Stark white sculptures in prescription vials stand behind medicine cabinet doors. Emerging brain imaging techniques offer source material for larger scale drawings. Just before an exhibition with the Royal Academy in 1832, artist JMW Turner walked up to his featured painting Helvoetsluys and added a small dot of vermillion. It was later said that this act showed that “…real artistry lies in restraint and understanding.” The single red dot became a recurring feature in many of Turner’s works. Turner’s red dot, and what it stands for, has influenced Harriet Lesser’s new series of works, which are compositions of both intensity and restraint. These watercolors and monoprints are about space: what lies between earth, sea and sky, off the coast of Skopelos, Greece. At night I dreamed about these spaces and each day I recreated them. Keeler presents a series of Jungian-influenced self-portraits that reference male figures—both historical and fictional—who seem to live in her psyche and support her development as a person and as an artist. Her hyper-female presentations of these figures in the self-portraits represent the integration of relevant animus qualities into her psyche. Klagsbrun continues her exploration of the fluidity of form, the crossing of boundaries, the instability of identity. This series of intricate color pencil drawings involve a cow’s skull, a bird, an orchid. Lisa Allen felt compelled to capture the historic moments following Donald Trump's presidential inauguration. These images are a selection of the events of the following two days in downtown Washington, DC. In this series, the artist explores the complexity of tai chi footwork focusing on movements and stances which both begin and end the exercise form. Formal analysis gives way to winding meanderings in the lines that connect the movements of physical and creative energy. The “Details” in Jo Levine’s photographs are components of art objects and buildings, mostly in the Washington area. She finds that focusing on a subject’s parts can transform an otherwise mundane, “straight” photo into something new and different – perhaps demonstrating, as architects like to say, that “God is in the details.” Levine hopes that her photos will inspire viewers to look more closely at the shapes and patterns in the world around them. Permeable intersections is from a body of work that focuses on balance and intersections with light and shadow. The image of the winged woman holding a white egg was taken in 1997. As a ﬁrst-year graduate student at American University studying ﬁlm and photography, I overdeveloped the film to achieve the very grainy, yet celestial look I wanted. Two hours into 2017, I received a message from Indonesia: a friend had passed away. We'd know each other since we were six years old -- she was the winged woman I had photographed 20 years ago. Orchids, bare branches and gardens in winter are sources for new paintings by Kiki McGrath. Abstracting from the natural world, her gestural brushstrokes distill intricate forms that suggest gnarled roots or climbing vines. In her installation at Studio Gallery she responds to live arrangements by six Ikebana artists. Together they explore relationships between painting and sculpture based on the Japanese art of flower arranging. Comic strips and photonovels (also known as fumetti or fotonovelas) are the inspiration for Elizabeth Casqueiro’s new body of work, titled “Fumetti Redux.” These two storytelling genres, one colorful and action packed, the other moody and staged, provided her quiet and protected Iberian childhood with an exciting means of escape to worlds where good prevailed over evil and human passions played center stage. At that time, comic books were an expense and a luxury, being mostly imported, so they were treasured and repeatedly savored when meager allowances permitted their purchase. Photonovels were read in hiding, with delicious sneak peaks and rapid scanning in the mostly female venues where the crumpled magazines could be found (such as the local hair salon frequented by Elizabeth’s mother). Today, Elizabeth recognizes the powerful impact these genres had on the early development of her value system, and is glad to see the resurgence of the fumetti as a health-focused didactic tool for less-literate audiences in developing areas of the world. These color photographs by Gary Anthes evoke the spirit of Norman Rockwell, but incorporate a dark and enigmatic feeling. Dots and dashes, pods and branches... musings and mark-making in the moment. Crocetta's recent works are reflections on nature and the human condition. The high heat and stress inside a wood kiln are transformational — a lot like life. These new figures by Chris Corson capture the strength and power that can emerge. Encaustic begins hot. Once its molten surface cools, light reveals hidden depth and detail that seduce and intrigue the viewer. Gallery goers are routinely delighted by how each artist interprets using wax with such individualized technical expression, exposing them to new and uniquely captivating art forms. “Heat + Light” will explore the hidden allure of this complex medium. This exhibit showcases the work of artists who create in the same studio center. Using a multitude of techniques, disciplines and approaches to the content of their art, they are connected and influenced by their daily interactions and conversations. Situated within the Gateway Arts District in the “Artists by the Tracks” section of Mount Rainier, Otis Street Arts Project serves as artist studios, exhibition space, and a creative incubator for those interested in a dynamic, supportive, and community oriented work environment of professional artists. More contemplations inspired by Himalayan prayer flags and India’s ancient Pali script: The Buddha in various aspects. Desires. Longings. A sutra and a story as mandalas. Words and letters in Pali, breathing light, dancing on the wind, making their way to the center of all things. On specially prepared watercolor paper. In brilliant quinacridone and natural earth pigments. JOIN US FOR FIRST FRIDAY - DECEMBER 2ND, 6 - 8 PM. Works inspired by love texts, highlighting the need for more love in today's turbulent times and celebrating the love that surrounds this time of the year. In the spirit of the winter holidays, in the downstairs garden gallery, we offer a unique selection of original works priced at $150 or less. Our family oral and written testimonies often conflict with one another; the gaps in information may deny us a complete understanding of our origins and yet all of us have stories to tell. This exhibit examines how book artists explore, interpret and illustrate our collective memory. Leading DC art photographers and educators, including Gary Anthes, Iwan Bagus, Andy Bloxham, Soomin Ham, Amy Hendrick, Leena Jayaswal, Steven Marks, Rania Razek, Shaun Schroth, and Alexandra Silverthorne will explore the nexus between art theory and photographic practice. The work will show how varied conceptual models of, and approaches to, photography - and the other visual, performance, and literary arts - have shaped their picture making. The show is curated by Steven Marks, Studio Gallery, and Iwan Bagus, professor of photography at the University of the District of Columba. Life goes through periods of unified calm, only to be torn apart by any number of life events, and finally to come together in a new balanced form, distinct from the original state. 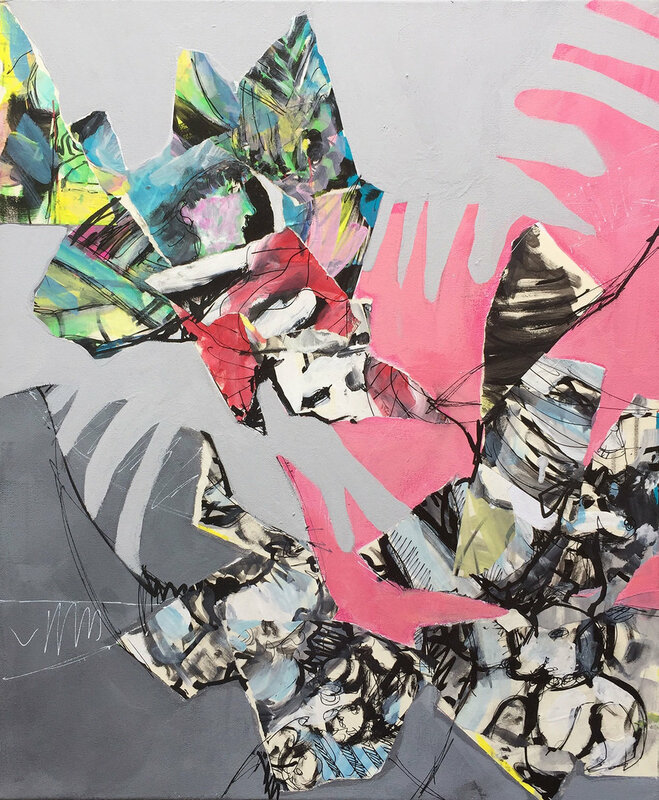 In Casqueiro's recent work, she explores this cycle of fragmentation and reconstruction. She creates images on paper of memories, experiences, and random thoughts, tears them up, and brings them together in a satisfying composition. Mirroring life, the results are surprising and often beautiful, and reveal new truths and perspectives that she had not considered before. Kim’s works center around two main concepts. The first is the experimentation of materials and how seemingly unmatched objects can be used to create art. Kim is searching for materials that are flexible and can be repurposed or reshaped. This exploration lead her to investigate the use of space, which is the second concept that pervades her work. Each time she creates a work, she keeps the physical space in mind. Her art, the walls, the viewers, and light each create another dimension. This series, “Square Sculpture Series,” is composed of individual canvas boxes. 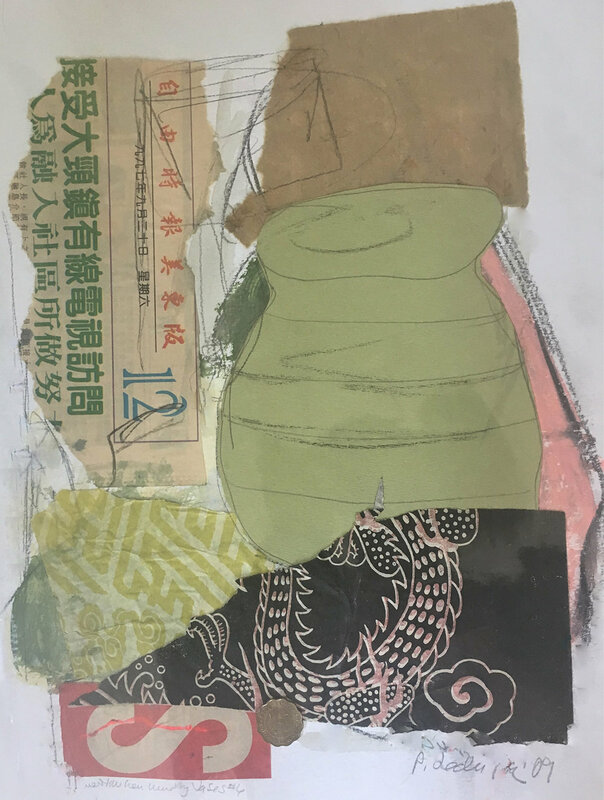 Frederick has applied her painting and collage language of using shapes and objects in an attempt to give the boxes weight, shape and depth in a three-dimensional space. Kraft exhibits three decades of artwork created through the years, chosen from her observations of people from drawings in her sketchbook and then often reproduced on canvas as a finished work. 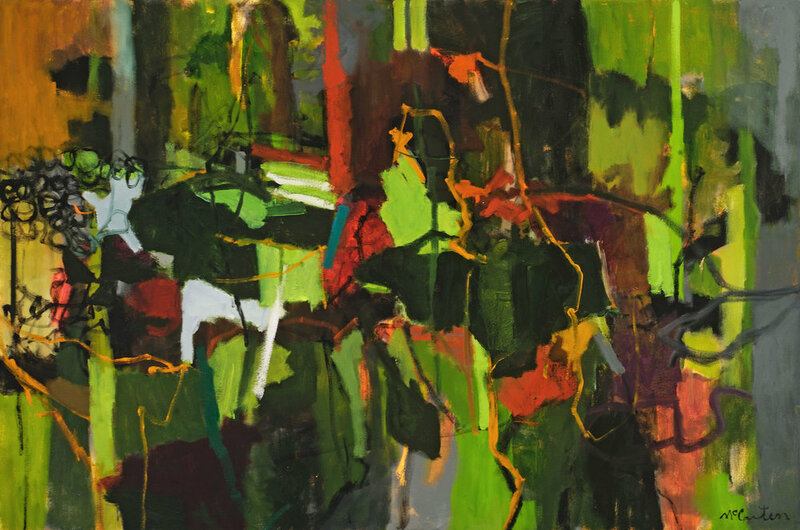 Levie’s oil paintings, done in an expressionist mode, draw heavily on the natural world as she arranges and rearranges the elements and colors of nature to appeal to the eye and the imagination, in this exhibit focusing on forests and trees. A portion of her sales will benefit the Amazon Conservation Association. Binder is showing urban-themed work in oil — densely packed cityscapes, skylines and streetscapes — along with aluminum backed drawings and other dry media and notebooks of similar themed small drawings, including scenes of Washington DC.